Farmgirl Fare: Thursday Dose of Cute: Where There Are Flowers. . .
Thursday Dose of Cute: Where There Are Flowers. . . Calling All Owners of Rescued and Adopted Dogs: Your Pet Could Be One of the 2009 Faces of Love! How can you not love somebody who proudly calls herself a 'crazy dog lady?' That would be my dear friend and talented artist, Leigh Jackson, who says in her bio, "I found the loves of my life—except my husband—at animal shelters." 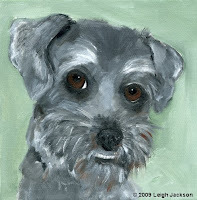 Leigh's affordable modern dog portraits, which wonderfully capture the unique spirit of each beloved animal, are in hundreds of dog-loving homes worldwide (including many Hollywood celebrities') and have been featured in such publications as Mary Engelbreit's Home Companion and the Miami Herald. Leigh's latest project is called Faces of Love, and you're invited to submit photos of your dog for consideration (with no obligation to purchase a portrait). "I am looking to paint all the wonderful rescued and adopted dogs out there: big, small, furry and not so furry," explains Leigh. She wants to share their stories, too, like Jak's, who is pictured below. He's a "foster dog extraordinaire" who "has raised upward of 50 kittens and helped rehabilitated 5 injured dogs. . . and even helped raise a baby squirrel." Ten percent of purchases from this year-long project, which includes paintings, prints, a 2010 calendar, and a compilation book, will be donated to A Place to Bark Animal Rescue, Bernie Berlin's amazing sanctuary in Tennessee. I've written about Bernie and her tireless efforts to save hundreds of unwanted dogs and puppies from certain death before. She is a true inspiration, and I thank all of you who have generously made donations to A Place to Bark. You can learn more about Leigh's 2009 Faces of Love project here, and you can see the dogs she's already painted—along with the photos that she painted them from—here. I know many of you have welcomed rescued and adopted animals into your lives, and I hope you'll let me know if your dog becomes one of the 2009 Faces of Love! © Copyright 2009 FarmgirlFare.com, the laid back furry foodie farm blog where even if the dogs are sitting right on top of the flowers (which is what Bear happens to be doing in this photo), we still wouldn't trade them for the world. And besides, at least the dogs don't eat the the flowers like some of the critters around here do. Green?! I love the color green! Oh, what a wonderful site you have introduced us to - thank you! Leigh's talent is amazing - what a gift she has (in so many ways!) I can't wait to explore her site and read all about her work. Love the photo of Bear in the flowers - beautiful! As always Bear is looking good. I have 2 adopted kitties, 3 rescued toads (exotics, can't be released) and a rescued exotic newt. But, no room here for dogs, unfortunately. Next house. Did you always have those cute chickens on your blog banner, or are they new additions? You've added chickens to your header! And isn't that a new sheep there as well? Oh, I thought the chickens were a new addition to your header, but then I thought maybe I just didn't remember (or maybe losing my mind - a big possibility!! ha!ha!). So it's good to know that someone else noticed them too & I'm not nuts! Your header is adorable! What a wonderful blog! I just found you surfing the web and I too have always dreamed of being a farm girl and I'm so happy that now I am one! We have miniature donkeys & horses, goats, chickens, ducks, and many rescued doggies + to little cats. Might have to send my 2 babes -my rescued Jack Russell and Schnoodles picture in! Keep on farming, your blog is wonderful!